Zoe asking Clive if he's ever thought of renting out a room at his place. Clive replying that his sharing days are over. Jim inviting Paul to have a look around the engineering works. Paul insisting that he's not interested in a job there. Des ‘phoning Daphne late on the night before the wedding to tell her that he loves her. Daphne telling him that she loves him too. SHANE: Well, mate, this is it: the happiest day of your life, eh? Des looks across at No. 28 and Shane asks in concern if he's thinking of popping over and seeing the bride, as they say it's bad luck. DES: No, no, I'm just going for a walk. I know it's stupid; I've just got this feeling in my guts – I'm sure something's going to go wrong. SHANE: It's just pre-wedding nerves, mate – and the fact that your previous attempts at marriage haven't exactly been successful! SHANE: No, I'll tell you what, Des: if I was in your shoes, I'd be over the moon. I don't think you realise how lucky you are, mate: Daphne's a great girl. DES: Shane, why didn't you ask her to marry *you*? I mean, you went out with her for the best part of a year, and you both seemed pretty keen on each other. SHANE: I don't really know, Des – but I'll be honest with you, mate: if we could turn back the clock, I would: I'd be standing in your shoes today. But I had my chance and I blew it. I've come to terms with that; believe me: I've seen what living in the past can do to people. DES: So there's no hard feelings? SHANE (smiles): Course not. I'm happy for you; *both* of you. Besides, you two are *made* for each other! SHANE: Don't be late, mate: she'll kill you! LUCY: Des, a few months ago, you said you were going to get married to *me*. DES (teases): Hang on – you knocked me back, remember?! LUCY: You know, Des, I hope you'll be nice to Daphne, ‘cos otherwise she might run out on you like Terry did to Paul. PAUL: Thanks, Lucy. Thanks a lot. LUCY: I didn't mean it, Paul; I just forgot. Helen comments that Paul is still so terribly hurt. Jim, however, asks angrily how much longer they have to carry on pretending nothing ever happened; Paul has got to learn to talk about it. Des says *he* might go and have a word with Paul, and he heads out the back. DES: Lucy's pretty tactful sometimes, eh?! PAUL: Sorry, mate. 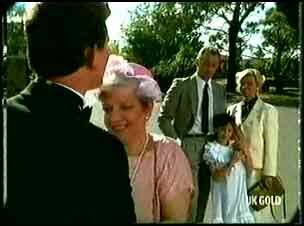 I know I'm being a bit selfish, but all this talk about weddings is bringing back pretty awful memories, you know? DES: Yeah, well, *I'm* the one who's being selfish. When I asked you to be best man, I didn't think what I'd be putting you through. Paul, if you don't want to do it, I'll understand – really. PAUL: And miss out on doing that brilliant speech I've prepared? No way! PAUL: *Sure* I'm sure. Anyway, I'd rather be thinking of you and Daphne than me and Terry at the moment. DES (smiles): Good on ya. PAUL: Anyway – *somebody's* got to hold your hand: I know what an old woman you are! Des gives Paul a good-natured shove! DAPHNE: There are three golden rules: don't cash cheques; don't give credit; and always keep an eye on the door. Some people would rob you blind! As she talks, she glances out the window and spots Des and Paul in the street. Zoe dashes over to her and orders her away from the window! DAPHNE: I thought it was only bad luck if *he* saw *me*. ZOE: There's no point in tempting fate, is there? Shane is ironing a shirt when Max comes in from work. Shane mutters at him to get a move on, as they haven't got much time. Max asks where Madge is. Shane shrugs that he doesn't know: some bloke rang for her and she grabbed her purse and shot off. Max heads off to have a bath as Danny joins Shane and asks if he's seen his razor blades. Shane retorts that they're on the top shelf, where they always are. Max rejoins Shane and ask him to iron a shirt for *him*! There's a knock on the front door and Helen answers it to find Eileen on the step. She invites her in and tells her that she looks lovely. Eileen thanks her and asks how Desmond is. EILEEN: I thought I'd just pop over and have a few words with him before he ‘takes the plunge', so to speak! EILEEN: Desmond, I... I do know how you feel. DES (looking surprised): Do you? EILEEN: Yes. I know you've been let down and stood up more times than I care to remember. But I know that Daphne is different – so this time it's going to be all right, isn't it? DES: Actually, I *was* feeling quite relaxed! EILEEN: Oh, well don't relax *too* much! I mean, stand up straight, take your hands out of your pockets, don't slouch, remember your shoulders in front of all those people. EILEEN: I do hope you can be happy, Desmond. Helen rejoins them and suggests to Des that he'd better finish getting dressed. Eileen says quickly that she'll just pop over and see Daphne. She gives Des a warm kiss. There are four wedding dresses laid out on the couch, and Zoe exclaims to Daphne that she's never known anything like it! DAPHNE: Don't blame *me*! It's the woman in the boutique near the Coffee Shop: *she's* the one who said ‘take them all home and try them in your own time'! EILEEN: Ooo-oo! It's only me! SHANE (taken aback): Decide what? EILEEN (aghast): Daphne, he's a *man*! DAPHNE: Exactly. Well, it's a man I'm getting dressed up for. SHANE: That one's nice, but I guess the final decision's yours, Daphne. He then adds that the car's waiting outside and Max is finishing his bath. SHANE: This is one wedding I can promise you where the bride won't be late! MAX: What did you *do* in that bathroom? Fall asleep?! The front door opens suddenly and Clive comes in. Danny warns him quickly to keep it down. He then asks Clive what he can do for him. CLIVE: How would you like to make yourself a quick fifty bucks? CLIVE: One of my regulars has let me down and I need you to do a gorillagram this arvo. DANNY: I *can't* this arvo; I've got to go to Des's wedding. CLIVE: You can go to a wedding *any* time, but it's not every day fifty bucks drops into your lap. DANNY (insists): I can't mate; it wouldn't be right. CLIVE: All right: seventy, owing to short notice. DANNY: It's not the money. You don't understand. CLIVE: What about this girl you're so fond of? Didn't she say she'd do anything for the guy who could take her up to Surfers Paradise? CLIVE: A hundred bucks. That's my final offer. DANNY: No, it is out of the question; it--; how much did you say?! CLIVE: One hundred big ones. DANNY: Right. You're on! Look out Surfers! SHANE: If you miss Des's wedding, Danny, I'll *kill* you. CLIVE (insists): He'll be there; don't worry. CLIVE: Then I'll pick up Danny, he can get changed in the back of the car and I'll drop him off at the church. SHANE (grimly): It'd *better* be. With that, Clive and Danny climb into Clive's car and Danny ducks down out of sight. They drive off as Max marches down the driveway of No. 24 and joins Shane. He's dressed in his suit and he asks Shane how he looks. Max then asks where Danny is. SHANE: Oh, er... he went on ahead. Max tells him they've got to pick up the bride. Zoe is standing in the lounge room at No. 28, staring at a posy of flowers, looking half happy and half sad. Max and Shane come in and Shane smiles at Zoe that she looks great! ZOE: You wait ‘til you see the *bride*! DAPHNE: Well, boys, what do you think? MAX: Not bad! Not bad at all, eh? MAX: Fine, fine. Reckon we ought to get a move on, but. That's if you've got nothing better to do, like! ZOE (smiles): You haven't got anything more important to do, have you, Daph? DAPHNE (laughs): No, I don't think so, Zoe! 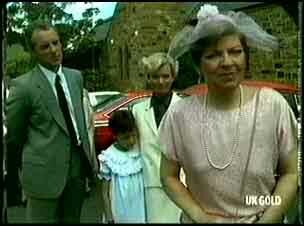 Eileen is standing with Helen, Jim and Lucy outside the church, asking in concern if they're sure Desmond is all right. EILEEN: I think he's just putting on a brave face. HELEN (chuckles): Eileen, it's a wedding, not a funeral! EILEEN (agitatedly): I don't like it: he should've been *here* by now. JIM: Oh no he shouldn't – they've still got a few minutes before they're due here; and don't worry: Paul will get him here on time. EILEEN: She *is* the right girl for him, isn't she? JIM: Yes, of course she is. EILEEN: ‘Cos if *anybody* deserves happiness, it's my Desmond. JIM: I'm sure he'll be happy. They love each other, and Daphne's a wonderful girl. EILEEN: Yes. Yes. Wonderful. Wonderful. SHANE: Oh no... I *knew* something like this'd happen. SHANE: Danny Ramsay: *that's* what's the matter. Shane has spotted Danny – still wearing the gorilla costume, head and all – running along the side of the road. Shane hoots the car's horn and calls to Danny to get in. Max looks on blankly. As Danny climbs into the front seat, Shane adds that he thought Clive was going to drive Danny to the church. MAX (looking puzzled):*Clive*? I *knew* yous two were up to something. DAPHNE (giggles): I hope you don't think you're coming to my wedding dressed like *that*, Danny! GORILLA: Look, I don't know what you lot are on about, but if you don't shut up I'll blow your brains out. A few moments later, Max snaps at the gorilla that if this is some sort of joke, it isn't very funny. Daphne tells Shane to just drive; they're going to be late. GORILLA (angrily): How many times do I have to tell you? This is NO JOKE. MAX (curtly): Look, we're on our way to a wedding. She's [he indicates Daphne] the bride. ZOE: You don't want us to be late, do you? SHANE: What do you want with us, anyway? GORILLA (snaps): Belt-up, will you? I've got enough on me plate without worrying about *you* rattling on. *Drive*! SHANE: Look, be reasonable: just tell me what you want. GORILLA: You heard me: DRIVE! With that, Shane pulls away from the side of the road. EILEEN: Remember, Desmond: when you say ‘I do', speak up loudly and clearly. JIM: Yes, Des, that's very important! DES (mutters): Thanks, Jim, I knew I could rely on you, mate! EILEEN: I love you, Desmond. Good luck. DES (genuinely): Thanks for everything, mum. The limousine pulls to a stop on a muddy track and the gunman opens the door. Pointing the gun at everyone inside, he orders them out of the vehicle. ZOE (aghast): You can't just *leave* us here. SHANE: How are we supposed to get home? DAPHNE: And what about my wedding? GORILLA (snarls): Think yourself lucky, lady: I might be doing you a big favour. GORILLA: You won't recognise me, will you? DAPHNE: What are we going to do *now*? MAX: What *can* we do, love? Start walking. DAPHNE: At least it's not raining. There's a clap of thunder over the church! Jim heads outside to look for the bridal party, but there's no sign of them. He turns to the church and walks back inside. DAPHNE: This is probably going to give Des a heart attack. I wish there was some way we could let him know. ZOE: At least we've discovered *one* thing today. ZOE: It *is* bad luck to see the groom before the wedding. All of a sudden, a small blue car appears behind them. 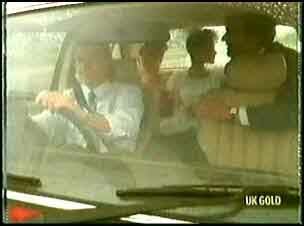 The four of them turn and run towards it, and Max yanks the passenger door open. The driver, looking astonished, asks what's going on. MAX: We need a lift to the city. Emergency. MAN: But I'm not *going* to the city. MAX: You are now, mate. DAPHNE: OK, everyone, you can relax: I'm here! PAUL: What the hell happened? MAX: Oh mate, you wouldn't believe it in a month of Sundays! I haven't got time to tell you now. Later, eh? SHANE: Before you start, mate, it wasn't my fault. DAPHNE: Well cheer up, Paul: I'm *here*! PAUL: I'm sorry, Daph: he's *gone*. I'm sorry. Daphne stands there looking devastated.